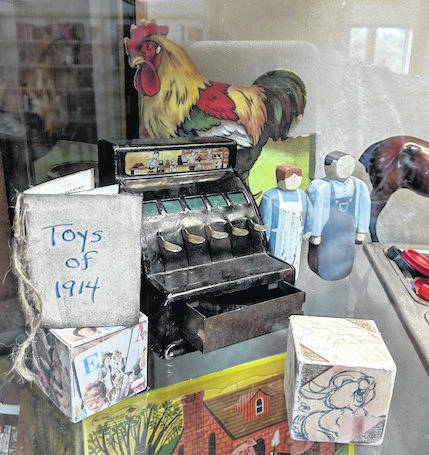 MOUNT GILEAD — Visitors and patrons at the Mount Gilead Public Library will find a captivating display of antique toys, games and puzzles in the display case on the second floor this month. The collection belongs to Denise Corney of the Galion area. 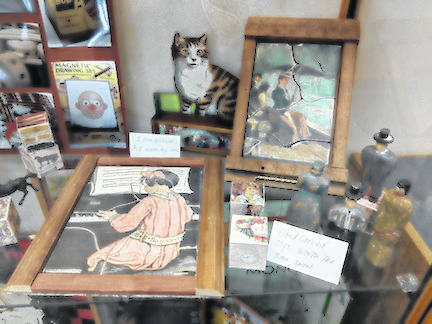 Corney collects antique toys and puzzles made from cast iron, tin, wood and paper. She stays away from anything plastic and everything made in China. Corney has picked up items at thrift stores, antique shops and flea markets. She recently got an old toy potato gun at the Mount Gilead Goodwill store. She is especially happy with the new antique store on the square in Mount Gilead. Corney enjoys making toys and made most of the puzzles in the display case as well as many blocks. Recovering old wooden blocks with paper designs is a hobby she enjoys in the winter. She gets many ideas online from Pinterest. She also carved the people in the display by hand. The age of the collection varies from games from the 40s, 50s and 60s to a cast iron circus wagon and toy cannon from a grandparent. She is pretty sure a cast iron toy cash register dates from the 1800s. The rocking horse on top of the display case is 100 years old. “It’s wonderful how these old toys hold up in such good condition,” said Corney. She believes part of the reason they are so well kept is that children in the past had fewer toys and were more careful with them. She also notes that the toys were made to last. Library Director Mike Kirk said the toy collection will be on display until the end of August. The display case gets a new theme and collection every two months. 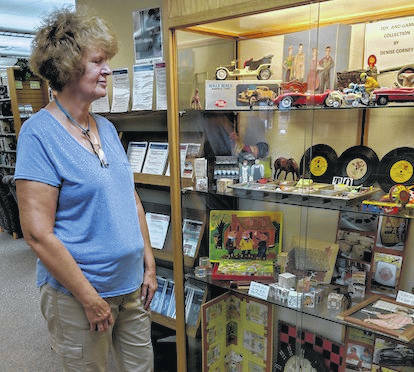 Library assistant Sharon Bailey said the display of old toys and puzzles has been a favorite this summer. She often sees people gathered around the display case looking at every piece on the shelves. Older people often comment that they had toys just like those on display and children also love to look at the old toys and games. Mount Gilead Library hours are Mon-Thurs. 10:30 a.m.-7 p.m., Friday and Saturday 10:30 a.m. to 5 p.m.